It takes a certain type of person to start and run their own business. There’s so much you have to do, so much you have to know and it can all feel very overwhelming at times. As a business owner, it’s your responsibility to keep up to date and informed. Ignorance is no defence! Lost in a sea of business advice and opinion? There’s so much information around that it’s hard to know what’s good and what isn’t, what’s important to deal with immediately and what you can safely put on the back burner. 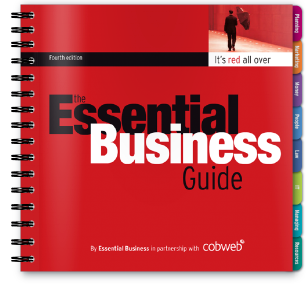 Here’s where The Essential Business Guide can help. From cover to cover, this award-winning Guide is packed with invaluable business information, making it the perfect business book to keep on your desk and refer to time and again. 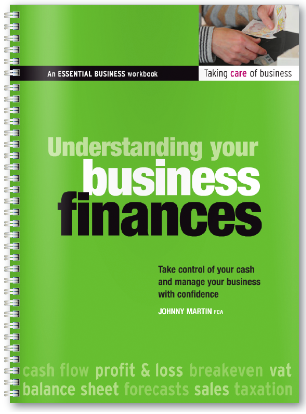 First published in 2002, it has been useful to thousands of business owners across the UK. If there’s one aspect of business you need to know inside out, it’s finance. Get it wrong and the effects can be very painful. If you don’t know your balance sheet from your KPIs, then Understanding Your Business Finances will prove very useful. The workbook takes you step by step through the process of defining a business model, creating your sales forecast and producing your key financial reports – the profit and loss, balance sheet and cashflow forecast. Needing a gentle nudge in the right direction? When you run a business, the day-to-day pressure can sometimes get in the way of you taking the time to build your business skills and tackle the boring-but-important admin tasks. 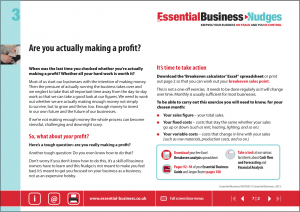 Our free Essential Business NUDGES give you a weekly reminder of those crucial tasks. They are designed to keep you on track and your business moving forward. Business support professional looking for ideas? Essential Business guides, workbooks, courses and resources offer a cost-effective way to acquire tried and tested materials that can be customised to reflect your brand. Discounts are available on volume orders for licensed professional use. If you would like to place a bulk order or find out more about bespoke publishing options, please take a look here or call Marianne Whitfield on 0191 461 8020.